Desert Eagle Bus Beneath cloudless skies and in the midst of burning hot sand, the Californian Desert keeps hidden treasures. Be careful, if you want to find them. You might encounter a Desert Eagle. Everyone who’s not so much into treasure hunting can watch a little extract of what happened a few weeks ago: “Operation Desert Eagle” – Nychos vs. the Californian Desert, filmed by Vertex Photography. Go check it out! White Rabbit Special Thanks to... Read more..
We are exploring our new terrain. As you can tell from the pictures, our white rabbits are hopping around San Francisco and are breeding like…well…rabbits. It must be the spirit of the city. Have you already spotted one of them? Juxtapoz Magazine has. (Thanks for the feature!) Scroll down and check out our very first clothing collection for the Bay Area. If you like what you see, go and visit our US web shop: www.rabbiteyemovement.shop. We love to see them multiply!... Read more.. The Rabbit Eye Movement Anatomy Sheets are moving on to the second round and this time, it’s all about the fauna. The first series narrated the merging of the three forces in Nychos’ art work: The inward urge, represented by the Rabbit, the slicing skills of the Raptor’s claw and the artistic mind, embodied by the Human. If you know Nychos’ work, you know what happens when you apply all the three forces. 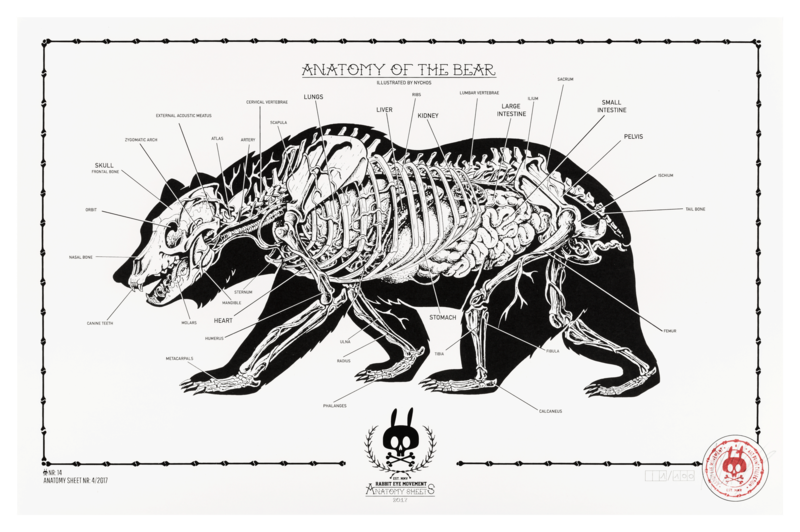 In the second series of the Rabbit... Read more..
What do George Lucas and Nychos have in common? They both reveal what’s beneath Darth Vader’s mask. Sorry that this sounds like a bad joke – we are serious! Almost a year after the big success of his solo exhibition “IKON” at Jonathan Levine Gallery, Nychos revives the header image of his show. “Dissection Of Darth Vader’s Head” is finally available as a screen print in an edition of 50 pieces. All prints are hand embellished by Nychos himself, giving... Read more..
U.S. LAUNCH – WE ARE RABBIT EYE MOVING TO THE BAY AREA! Sittin’ in the morning sun, we’ll be sittin’ when the evening comes. We’re sittin’ on the dock of the Bay, finallllyyyyyy! Some of you sensed it, some of you prayed for it, now it’s official: We are Rabbit Eye Moving to the Bay Area! Since Nychos (founder and CCO) relocated to San Francisco earlier this year, he has been busy establishing a second home for us. Successfully! From now on we are operating another burrow in The Golden State, taking care of all... Read more..
DXTR The Weird and NYCHOS The Weird met up in California a while back and this is what happened. While it’s not uncommon to see Nychos out and about in the states these days, it doesn’t happen too often to see two weirdos join forces on the other side of the pond. After The Weird exhibition in Austin, DXTR set off to San Francisco to visit the chief rabbit. Apparently the weather sucked so the two decided to take a little road trip to Los Angeles.... Read more..
Nychos will present the sculpture project “Vienna Therapy”, open a solo exhibition, give workshops, and paint murals in spring 2017. Melbourne is in for a treat, Nychos solo exhibition “MONOCHROME ORGANISM” will be opening on March 10th at 6 p.m. at Juddy Roller gallery. In February Nychos will be heading to Australia with quite a schedule. Not only will he be painting Murals in Sydney and Melbourne, Nychos will be giving workshops in both cities. Organised by the amazing people at Work-Shop you can gain insights... Read more..
REM Hiatus February 2017 – We are on holiday! A lot has happened last year and the Rabbits have been working nonstop on finding new ways to push the movement even further. With frequently dropping temperatures here in Vienna, the Rabbits decided to go into hiding. It is time to take a breath and reflect on past projects in order to go into the new year as productive and motivated as possible. The Art Space will be closed from Monday, 30th of January until 28th of February. While we’ll be... Read more..
We know Christmas shopping can be stressful. So we decided to extend our Opening Hours in December. We’ll help you pick out the perfect presents from Thursday to Saturday for the next few weeks. To make sure our team can be with their families and friends, we will be closed on the 24th and the 31st of December. Where to find us: Gumpendorferstraße 91 1060 Vienna – Austria For any questions or appointments regarding a visit to the art... Read more..
“THE HUNT” / DXTR THE WEIRD / LINZ, AUSTRIA 2016 During the 5 Year Anniversary of The Weird Crew countless spray cans were emptied and many walls were painted. One of the mural’s created back then was DXTR‘s “The Hunt”. A mural that not only shows the artist’s unique style but reflects his views on today’s world affairs. DXTR was so kind and shared his thoughts with us. “Those who are familiar with my work might know that I like a simplified... Read more..